This special freeware AI package, produced by Military AI Works brings back the last true naval fighter, the mighty F-14 Tomcat, to your virtual FS2004 skies. 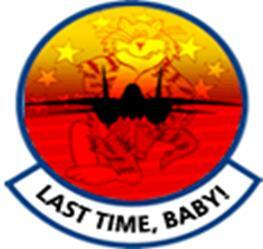 This package is the first of three MAIW releases honoring the F-14 Tomcat. This release depicts the United States Navy F-14 operations in their last days when only two squadrons remained, VF-31 “Tomcatters” and VF-213 “Black Lions”. This package contains repaints, AFCAD, flight plans and custom call signs for each depicted unit. All the VF-31 Aircraft will return to NAS Oceana on Sunday and recycle their Monday through Wednesday final flight departures again. For the VF-213 aircraft, in reality by the time the last VF-31 aircraft made their final flights, VF-213 had become VFA-213 and was already transitioning to the F-18F Super Hornet. We have decided to include these aircraft simulating their last operations as an F-14 unit still conducting regular training operations out of NAS Oceana. You will find these aircraft flying into and out of NAS Oceana and flying around the country and overseas most of the week in FS2004. This package is dedicated to all those who flew, maintained and loved the mighty Tomcat, there will NEVER be another aircraft like her. Anytime, Baby!…. The Flightplans are fictional, but have been researched via Internet and message forums. We have tried to make the plans as “realistic” as possible and have had to use our own judgment.